Little kids, big kids, even adult kids - everyone loves lollies! 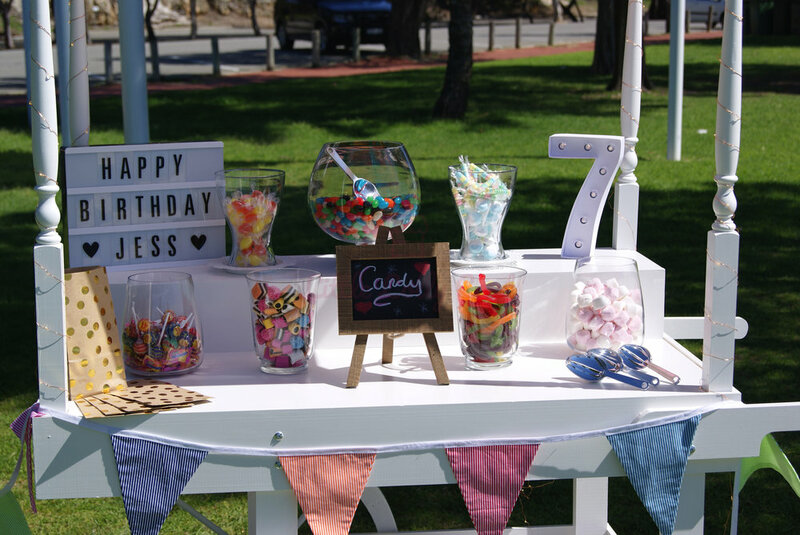 So for your next birthday party, what could be better than one of our lolly carts to make everyone feel like they've stumbled across a Willy Wonka Wonderland!? To keep things simple we have three birthday packages: Kids, Adults and Tailored and prices start from just $159! The 'Kids' package, perhaps unsurprisingly has been put together to be an ideal accompaniment to any children's birthday party and unlike other companies, we don't charge extra for including decorations! Our 'Adults' package is similar to the 'Kids' package (because aren't we all still just kids at heart? ), but we've altered the decorations to be slightly more "grown up" and increased the amount of lollies that are catered for. Finally, our 'Tailored' package, as the name suggests lets you specify certain aspects of the cart such as the canopy and bunting that you'd like to, well, tailor to your own specific requirements to really blow your guests away with something they have never seen before. Want to see even more? Take a look through our full gallery. 7 varieties of lollies for 20 guests - we'll contact you following booking to confirm the varieties you would like, but you can read more about Selecting Your Lollies here. Please note that we are happy to deliver beyond a 25km radius from Perth CBD (WA6000) but please be aware that each kilometre above 25km will be charged at 66 cents per kilometre as per ATO guidance. Got questions? Take a look at our FAQ or Contact Us. 7 varieties of lollies for 50 guests - we'll contact you following booking to confirm the varieties you would like, but you can read more about Selecting Your Lollies here. We will work with you prior to booking to ensure that we will be able to meet your needs within budget. Please use the button below to tell us a bit more about what you plan to do...let your imagination run wild!